Allergies can suddenly attack your system without you even realising that your body has adversely reacted to something. There are many natural anti-histamine agents present in everyday food items that you may already have in your fridge or cupboard and can be effective as home remedies for seasonal allergies. Adding some of these spices and herbs to our meals and drinks helped me and my family cope with seasonal allergies and bring back the spring to our lives! I never thought I could have allergies as I have always been in good health. It was only after moving to Switzerland that I noticed itchy eyes, embarrassing sniffles and sneezes around people. I knew that there was no way I could catch a cold when it’s a constant bright sunny 25 degrees outside. Many teas and tablets later, a trip to the doc confirmed I was allergic to every single tree, grass, plants including dogs and many fruits and Nuts! Wonder if they do an anti-kids and hubby test too :-), sure that would be a supersize Positive !! Today more and more people suffer from allergies due to the harsh environmental changes exposing the body to allergens! These become more heightened during the change of season, especially during the flowering period of spring. When your body is exposed to allergens, it confuses the immune system making it release histamines that attack cells in the body causing it to swell up and release water. Hence the watery eyes, nose and swelling of glands. If you suddenly wake up with sniffles, annoying sneezes or puffy eyes it may not be an after effect of a late night out, instead, it could be your body reacting to an alien attack! I read a lot on home remedies to help alleviate the symptoms of hayfever and allergies. The prolonged use of over the counter pills have a detrimental effect on our bodies, hence was looking for an alternative route. In my quest for search, I read many articles on different kinds of food and teas that you can take that promises to ‘cure’ allergies. I am a firm believer in natural remedy but I also take the word ‘cure ‘ a bit cautiously unless scientifically proven. ‘Remedy’ counteracts symptoms, while ‘cure’ is the solution! When I suggest people to add a specific spice, herb or any other food to their diet, its mostly as a supplement to alleviate symptoms and NOT a cure! Secondly, I also am not a great advocate to ask people to use ingredients that they may find difficult to buy or never use again! We all have busy life’s, a trip to a supermarket is a task in itself let alone going to specialist stores to look for ingredients. Unless of course, I have an internet option for it! Some people recommend using Stinging nettle, Ginko, Moringa, Holy Basil as brilliant natural anti-histamine supplements. They truly are, but they can be a bit hard to find. So I thought I will instead pull out ingredients that I have in my kitchen cabinet and share my experiences with you! To effectively combat seasonal allergies, intake of a natural antihistamine a month or two before the season begins can be most helpful. However a word of caution. Before you take any spices mentioned here or any others, make sure you do not have an intolerance to them. Afterall they are supposed to help relieve allergies not trigger it further! Here is my list of Top 5 everyday spices & herbs that are normally found in most kitchen drawers as seasonings. There has been so much talk about the benefits of this golden spice that I think most households will start keeping them now. Studies have shown that the active agent in Turmeric called curcumin fights histamine releases and boost the immunity system. Turmeric also has anti-inflammatory properties that help to soothe the inflamed glands caused by allergies. Add a tsp of turmeric to most food you eat, be it soups, marinades, stir-fries, casseroles anything. Turmeric is more of a colouring spice as opposed to a flavouring spice, therefore, it has little impact on the flavour but is great for health. Make Turmeric milk by adding a tsp of turmeric to warm milk and drink it every day before the change of season to help built up immunity. Few people may know this by the name of black cumin, black caraway, or even black sesame seeds. The active ingredient called Thymoquinone and protein Kinase C help fight against allergies and respiratory discomfort like asthma. It is also known to be beneficial in combating skin infections and flairs caused by an allergic reaction. Add 2 tsp of nigella seeds to your stir-fried vegetables. Grind and add it to soups. It really goes well with lentil soups. These unassuming looking savoury fruits have an abundance of good quality. It is high in natural antihistamine agent, Quercetin that prevents an allergic outbreak. Quercetin is a flavonol that helps to relieve allergies by reducing the inflammatory response in respiratory airways. Capers can be added to salads. You can also make caper pesto and use it as spreads and dips. Capers go very well with fish. Add them to your stews or fish bakes. Fennel seeds come from the aromatic fennel bulb. These sweet-scented seeds contain many vitamins, minerals, antioxidants, quercetin, and flavonoids, which all help to effectively treat allergic symptoms. Fennel seeds can be eaten raw. You can munch on a teaspoon or two of fennel seeds few times a day. Make fennel tea by boiling fennel seeds in water for about 5 minutes. Grind fennel seeds and add as a flavouring to curries, salad dressing or soups. How many times have we used Thyme in our pasta dishes, grills or dressings? It is full of vitamin C, flavonoids, and antibacterial properties which makes it an ideal antihistamine to fight off inflammations and neutralize histamine activity. The anti-microbial properties of Thyme inhibit the growth of bacteria and fungi in your body. Use Thyme in your salad dressing, marinades for fish and meat, sprinkle a generous amount on pasta dishes. You can also add thyme to many base sauces, stews and curries. Some of the most active natural anti-histamine agent present in many foods are Flavonoids, Quercetin, Omega-3 Fatty Acids, Vitamin C and Bromelain to name a few. It may surprise you to know how easily you can or already are consuming these beneficial minerals and enzymes that help build our immune system and wade off allergens. You really do not need to go for a special trip to a specialist health food store to buy any of these items. They may already be there in your fridge or cupboards. Increasing your intake of natural antihistamines at the beginning of the allergic season can help you get relief when experiencing unwanted allergic symptoms such as headaches, itching, congestion, and sneezing. 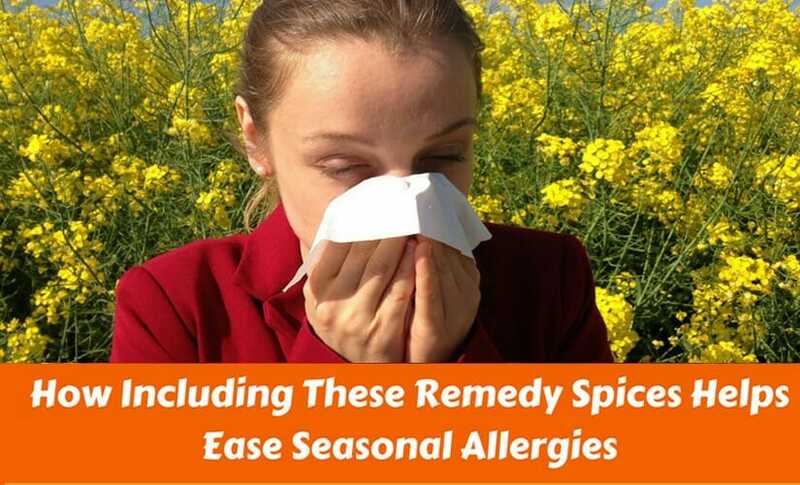 However, these natural home remedy to seasonal allergies may not work for everyone the same way. The effect of natural anti-histamine components depends on the severity of your allergy. These can be a supplement to your medication but not replacements in case your allergic symptoms are acute. Always seek medical advice in case of doubts about your symptoms. When you experience allergic symptoms, be sure to try the natural antihistamines listed in this article. You will be glad you did! Are you surprised to learn how unknowingly you have been benefiting yourselves by eating these common food items almost everyday? All you need to do is perhaps include a bit more in your diet and enjoy the joys of Spring and fresh air! I knew that there were anitinflammatories hiding in our pantry but didn’t associate that with treating seasonal allergies. What a great article, very informative, thanks so much! Such an amazing informational post! I suffer with allergies and this is a great way to use spices for a natural preventative! Thanks Jessica. Its good to have a natural remedy as far as possible. The regular intake of over the counter pills had started taking a negative effect on my body hence choose the alternative route as a supplement. Yep it’s allergy time here in Scotland too. Loving all these tips. Take care if you or your loved one suffer from these irritants. I had no idea spices could offer seasonal relief! Now I need to see if I have fennel! Thanks Ann. Glad that your symptoms have gone. For your own good, i hope they do not return. But enjoy adding these spices to your meals anyway. Thanks Alexa. DO try taking these spices before the season begins. They really do help. This is fascinating! Good information to take into consideration. I need to check my spice rack to make sure I have these on hand. Thanks. Glad you found the information useful. Helpful and interesting post. I like turmeric and I often add it to meat. I used to suffer from seasonal allergies, but I feel much better now. Is it because I have added turmeric to meat for some years now? Hi Alessandro. Good to hear that you have been adding Turmeric to your dishes. Turmeric is one of the best medicinal spice so it sure would have done your health good. Take care.